My husband’s favorite cookie would be Macadamia Nut Cookies, hands down! He always asks for them or orders them when we are out if there is the option. I love the ease of blondies! No rolling required! Just dump them into a pan and spread! When I saw this recipe from Life’s Simple Measures that combines mine and my hubby’s interests, I had to make them! He absolutely LOVED them! Wow, I'm so honored that you made something from my blog! Thank you so very much and I hope you enjoyed these as much as I did! I've always liked blondies, so I am anxious to try this recipe. But I think your Step 1, should be listed before your Step 7. Thanks for sharing this recipe! oh, i'm sure these melt in your mouth, I can wait to make them. I think the steps are out of order, but otherwise this recipe is at the top of my list to make soon! Make something that you just need one bowl and only mix the ingredients is a perfect recipe. Ok, we need additional time for the oven, but it's a very quick one right?. I love macadamia nuts, and I can't believe we don't have it, It's very very hard to find it on the market. oh my word! 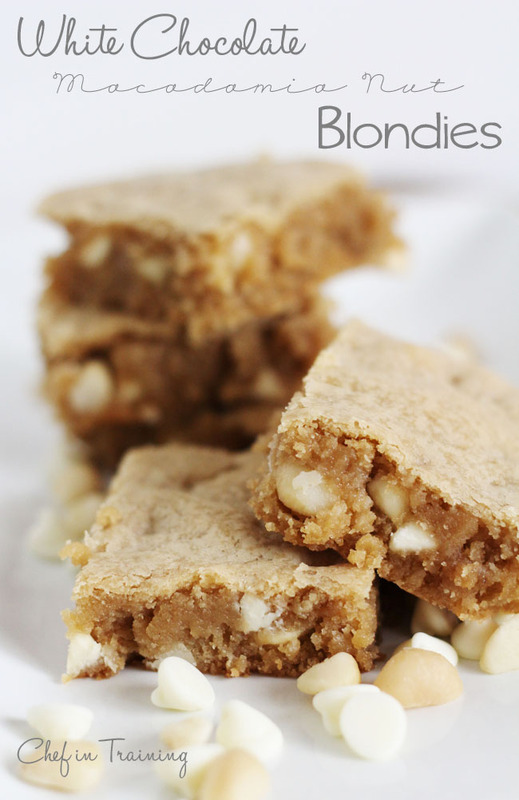 I love white choc macadamia cookies and these blondies look irresistible to me! These are delicious made with crushed pretzels instead of the macadamia nuts. YUM! Umm, I just baked these and I feel this was reposted as "Blondies" were a mistake. The dough is more like a cookie dough and it turned out to be a big cookie shaped like a brownie -disappointed!! the picture looks like a Blondie, however, it came out as a big cookie. I think the recipe needs to be adjusted?! I am sorry that happened for you. My picture is correct with following the recipes exactly. I live in higher elevation, so maybe by reducing the amount of flour slightly, you would see more of a blondie consistency than a cookie. Sorry you were disappointed and I hope this helps. Can I substitute any other nuts like walnuts for macademia nuts? They are not available in my country.